Based on your reporting period selected in the top-right corner of the page, your engagement score is a single number (derived from a series of algorithms) that represents the aggregate of multiple pieces of data about your organization / audience interactions. We measure the number of newsletters sent, opened, and clicked through during the timespan selected. On the other hand, engagement history is a measure of your engagement score over time. Rather than a single number, the history is a trend throughout your Cerkl's lifetime. They differ! 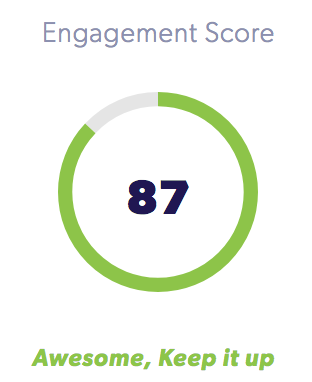 For example, if your engagement score over the Last 4 Weeks is 85, your engagement history might show that Week 1 of the 4-week period scored at 98, Week 2 at 60, Week 3 at 97, and Week 4 at 85. You can take that information and see what happened in Week 2 that caused your engagement to decrease and contrast that to was was so effective in Weeks 1 and 3.